MyOutdoors.co.uk has given an excellent review to Grizzly Bears and Razor Clams, which you can read here. With a weather forecast for a dry day and the clouds above the summits, very unusual in recent weeks, I decided it was time to head up onto the Cairngorm Plateau, especially when I realised with a shock that I hadn’t been there since May Day, when I skied across a snowbound world. 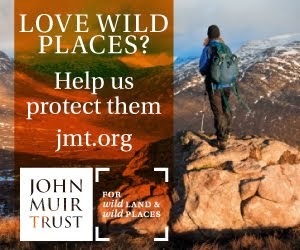 A whole series of events from the TGO Challenge to trips to Sweden and Germany have kept me away from my local hills. And when I have been home the constant low cloud has made wanderings in the forests and fields and beside the rivers more attractive than navigating through the mist high in the hills. I had a reason to visit the Plateau too, a reason that required clear views. The Mountaineering Council of Scotland has asked me to take photographs of the Allt Duine area from various points in the Cairngorms and Monadh Liath for the Public Inquiry into the proposed wind farm. Yesterday was the first day when such photographs seemed possible. 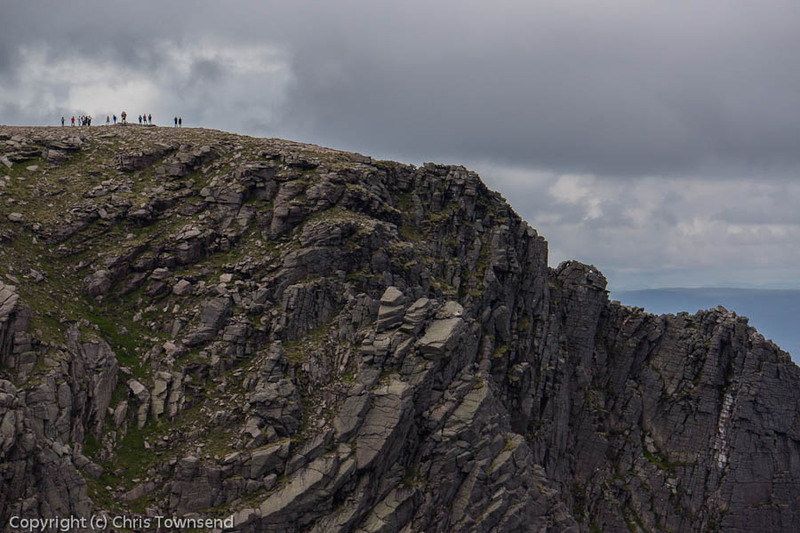 From a surprisingly only quarter full Coire Cas car park, the site of my first photos, I climbed up Sron an-t Aonaich (now signposted as Windy Ridge by Cairngorm Mountain, who run the ski resort) to the Ptarmigan Top Station and my second set of pictures. 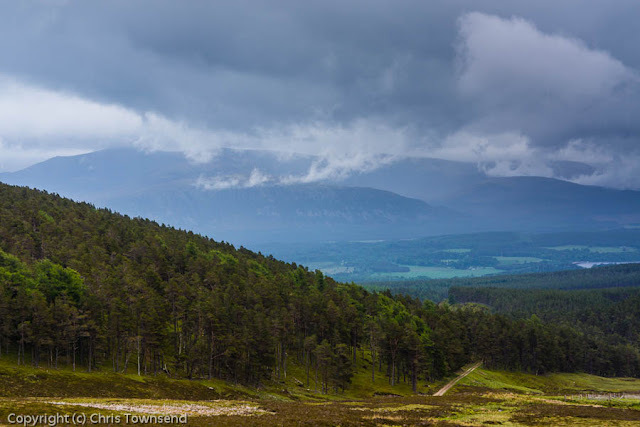 From here there is a spacious view over forested Glenmore to the Monadh Liath rising above Strathspey. The line of barely undulating moorland where the wind farm may be isn’t distinctive; it’s only a small part of the view. It is central though and big turbines there would be the dominant feature in the vista, totally changing it. I photographed the same view again from the summit of Cairn Gorm then set off to walk over the tops of the Northern Corries. 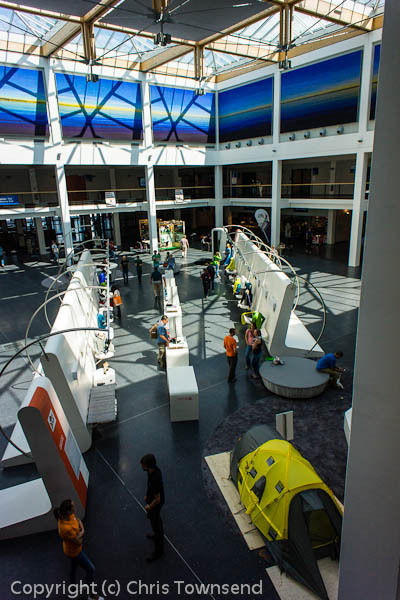 There was much to see and much going on. The hills were green with summer growth watered by the rains, a complete contrast to the snows of May. Only two big patches in Coire Domhain were a reminder of the late winter conditions. A cool west wind swept the Plateau, keeping the clouds moving. Very occasionally there was a burst of sunshine and the air was suddenly hot. There were squalls too, hiding the summits as they swept over them. I only caught the faint hints of rain as one passed nearby though. Unsurprisingly for a Saturday there were quite a few people about, with a large party at the top of the rocky spine of the Fiacaill Coire an t-Sneachda and rock climbers on the cliffs of that corrie and those in Coire an Lochain. 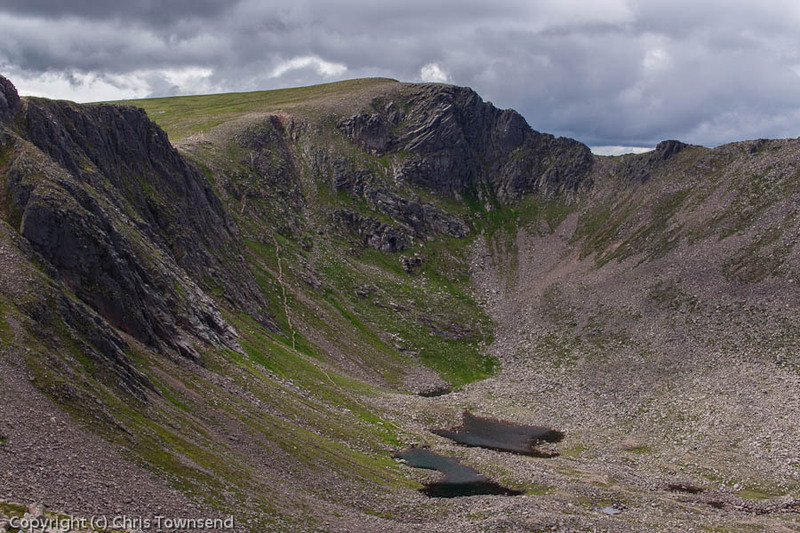 Down in the corries the little lochans were still full. Sometimes at this time of year they have shrunk almost away. Ptarmigan with chicks darted about amongst the stones, trying to remain hidden. 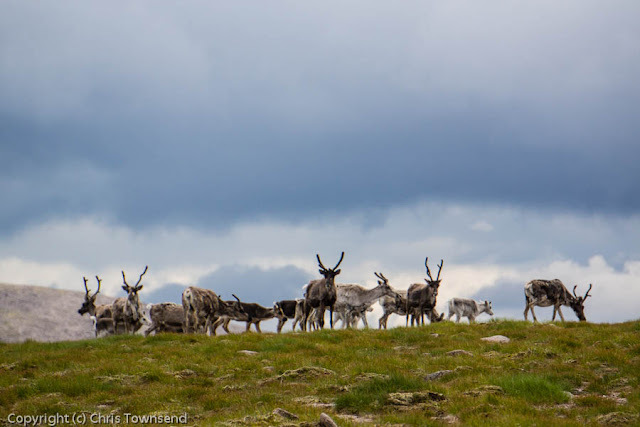 On the featureless slopes south of the summit of Cairn Lochan – a good place to get lost in mist – a herd of reindeer grazed on the moss and lazed on the stones. 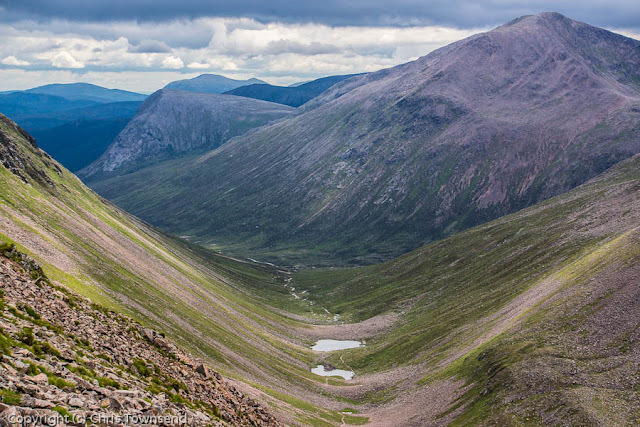 Below Cairn Lochan I wandered over to the edge of the great cleft of the Lairig Ghru pass and gazed for some time down this big slash in the hills to Cairn Toul, Bod an Deamhain and distant Beinn a'Ghlo. 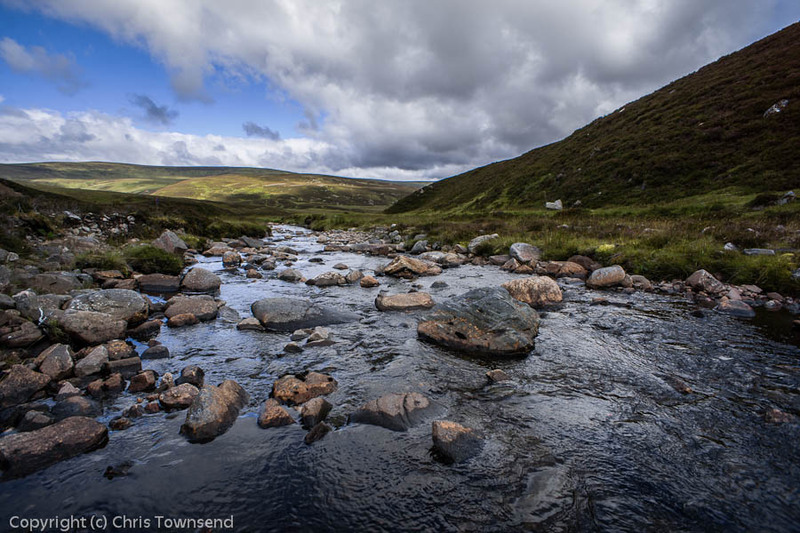 In the heart of the pass the Pools of Dee were shining and the slopes were green with vegetation between the ribbons of scree and boulders. 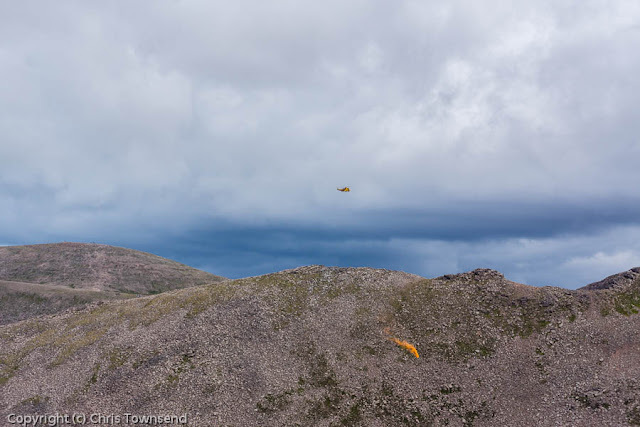 Descending the west wall of Coire Lochain I was disturbed then entertained by a big yellow RAF Mountain Rescue helicopter that flew over a few times then hovered above the Fiacaill Coire an t-Sneachda where it dropped a flare onto the slopes below then lowered down a winchman. A practise exercise I guessed. The walk ended with a walk across the soggy mouths of the corries, where the burns were in full flow. 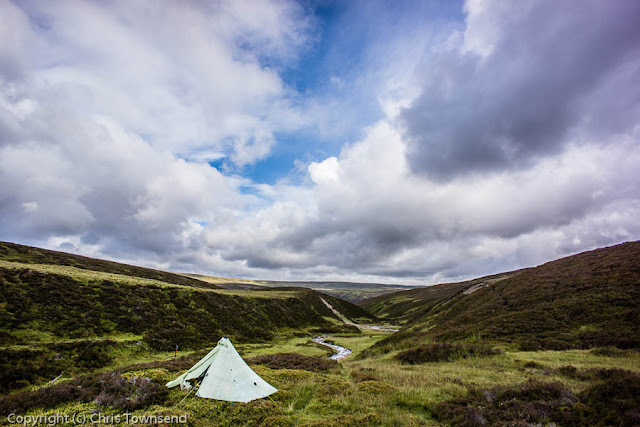 August TGO: 50-60 litre packs, Hilleberg Anjan and photographic thoughts. 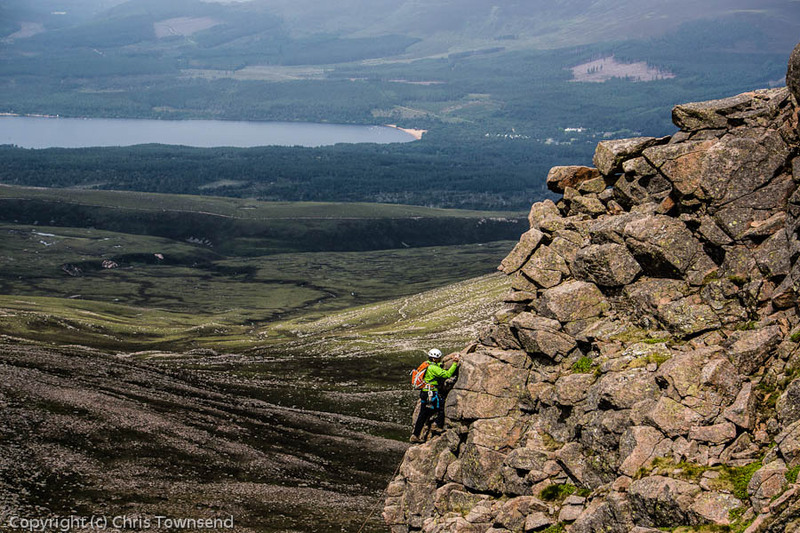 The August issue of TGO is out now. My contributions are a test report on fourteen 50-60 litre size packs, a first look at the new Hilleberg Anjan tent and some thoughts on photography and memories in my backpacking column. 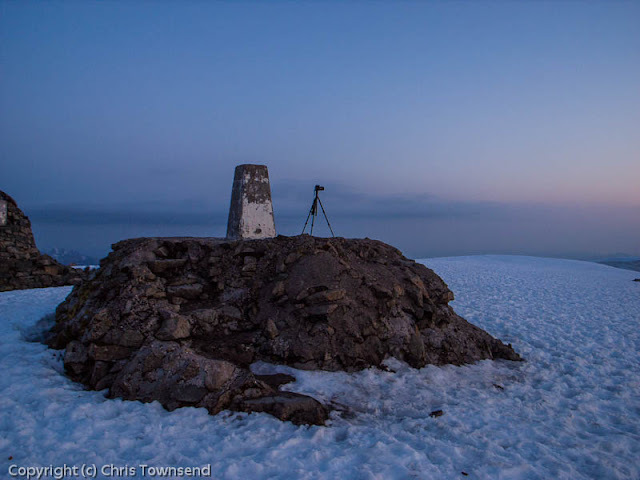 By coincidence my photography thoughts appear in the same issue as a truly stand-out photo essay from Glyn Davies called Sculpting the Light that features some outstanding images of Snowdonia from his latest book, Welsh Light. Elsewhere in the magazine two long challenge walks are described, both of which I happen to have done. The first is Ramsey’s Round over 23 Munros including Ben Nevis, the Mamores and the Grey Corries. Fell runners do this 56 mile jaunt in less than 24 hours. In the trip described here Ian Battersby takes four days, which was my time as well. Whether one day or four it’s well worth doing. In my view it’s one of the best mountain backpacking trips in Britain. 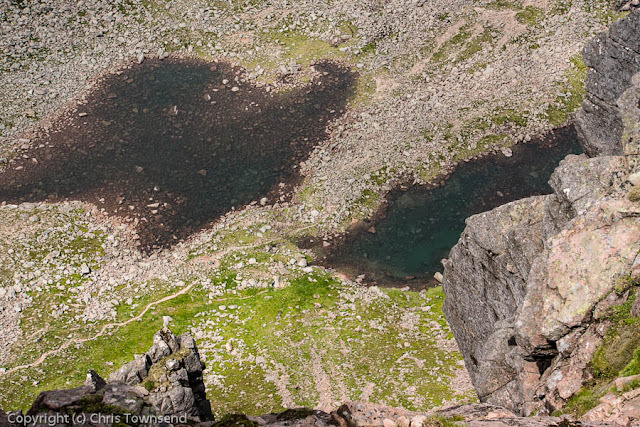 The second challenge walk is the Lakes 3,000-footers, a 45 mile trip that I did many years ago in my fell running days in a little under 14 hours. Roy Clayton takes a few attempts and a little longer and describes well what it feels like to undertake such a long day. Strenuous exercise of a different sort is undertaken by Ed Byrne as he tries his hand at path maintenance on the Pennine Way in the Peak District. 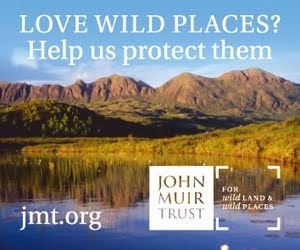 Also in the magazine are a profile of Everest climber Bonita Norris; thoughts on recent extremes of weather in the UK from Roger Smith; Jim Perrin on the wonderful poetry of Norman MacCaig; useful information on walking and camping with children, tick bites and grouse-shooting; and Jamie Whittle on the pleasures of walking by moonlight. In the gear pages Judy Armstrong reviews women’s base layers, Cameron McNeish likes the Mizuno Wave Strider GTX trail shoes and Daniel Neilson is eventually impressed by the Marmot Vapor Trail Hoody softshell. From 11 a.m. tomorrow I'll be at Waterstone's book shop in Aviemore to sign copies of Grizzly Bears and Razor Clams. If you're in the area and the rain's keeping you from the hills (the forecast looks nasty!) do call in. 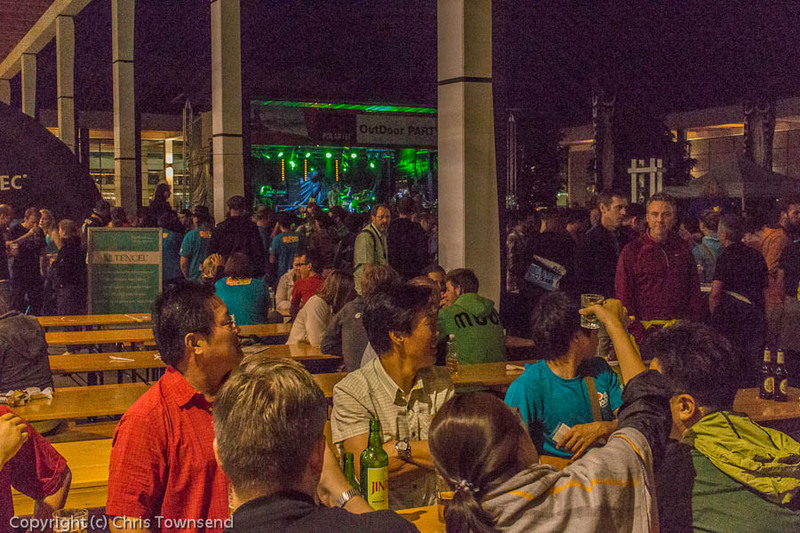 Outdoor shows are strange places. 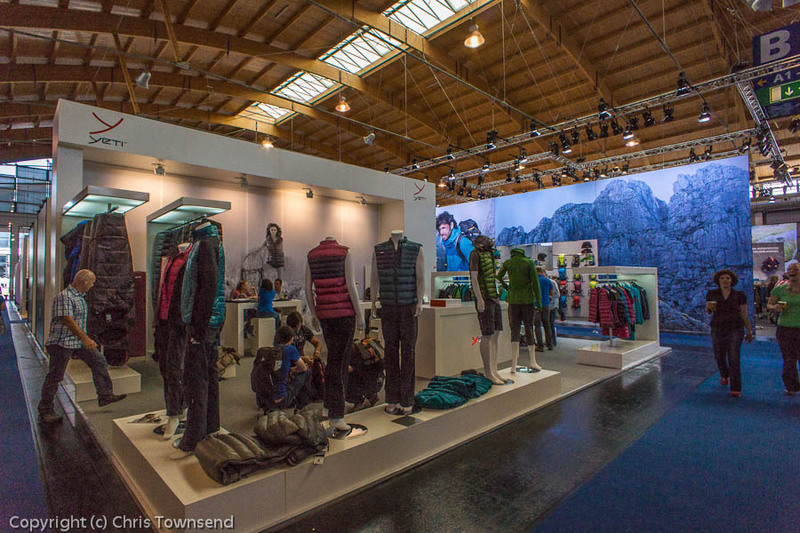 In vast, hot, artificially lit, windowless halls of concrete and steel little stands are built and filled with gear designed to keep users comfortable and safe outside in the real, natural world that can only be seen in the pictures of mountains and forests decorating the stands. This year at the giant OutDoor show in Friedrichshafen I camped just a few minutes walk away from the exhibition centre along with hundreds of others, including colleagues from TGO magazine. Sleeping in a tent and waking to bird song and the smell of wet grass (it rained every night) added a touch of reality. 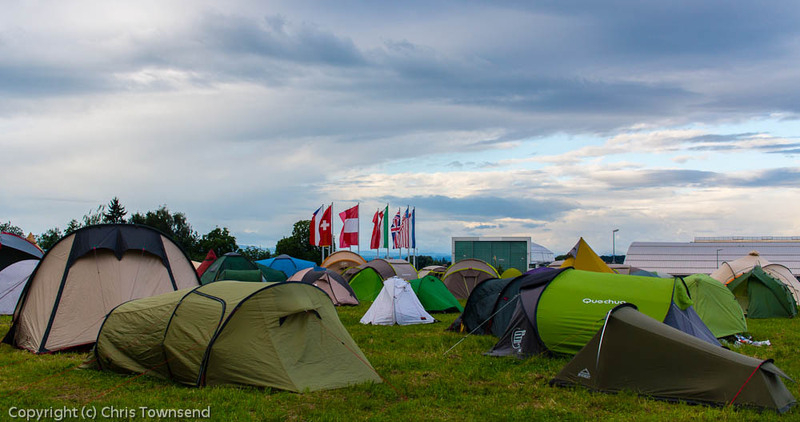 One morning I looked across the packed tents to see distant jagged peaks rising into the sky, the edge of the Alps, the real world. Then I grabbed my shoulder bag and cameras and headed off into the show, to spend the day out of sight of the mountains but in constant contact with gear designed for climbing and living in them. 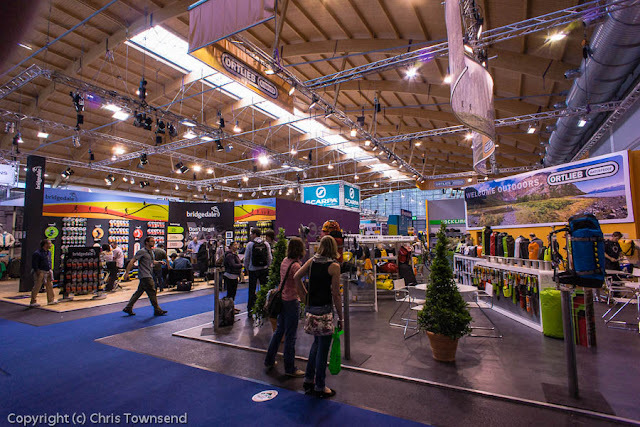 For two days I tramped the halls, visiting a succession of stands and seeing huge amounts of gear. Even so I missed much. Some themes became obvious though as the stands flashed past. Colour for one. Bright colours – sky blue, pink, orange, yellow – that repeated from company to company on everything from boots to packs. Trail running was another theme, with so much footwear and clothing aimed at it that you’d think it was the most popular outdoor activity. Light weight continued from past shows, though as before what is considered light varies enormously. Check the weights not the description! So did I see anything of any real interest? Yes, I did. 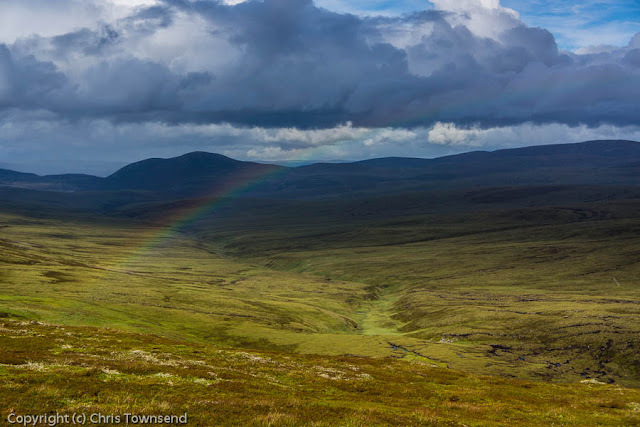 Detailed descriptions will appear in the September TGO (with some information on the TGO website before then) but here’s a taster. (There’s also some show reports from Daniel Neilson on the TGO site now). In footwear there were some curious shoes from Teva called TevaSphere with a sole claimed to perform better on all types of terrain plus, from Hanwag, some boots for anyone with bunions, inevitably to be known as Bunion Boots. 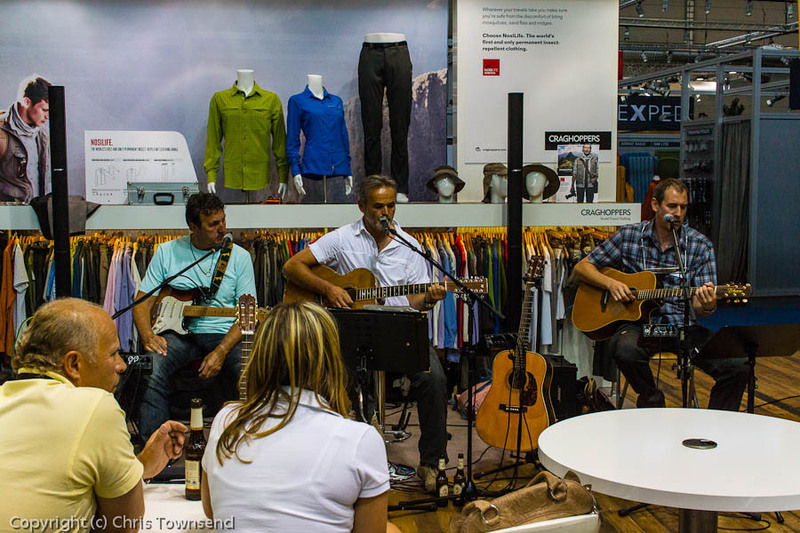 The Ecco Biom boots that won the Scandinavian Outdoor Award were also on show. 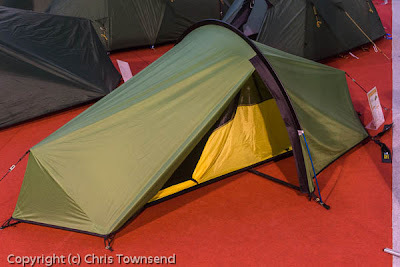 The most exciting tents were almost identical to the Terra Nova Laser models. Why exciting? Because the Wild Country Zephyros Lite 1 and 2 person tents are around half the price of the Lasers yet weigh only a little more and look, to my eye, just as good (better in one respect as the fiddly pole sleeve has been dispensed with). Also very light is the 880 gram 2 person Nordisk Telemark 2 Carbon tent. Away from these ultralight backpacking tents Crux showed a single-skin mountaineering tent, the X1 Assault, made from a carbon incorporating fabric claimed to minimise condensation. 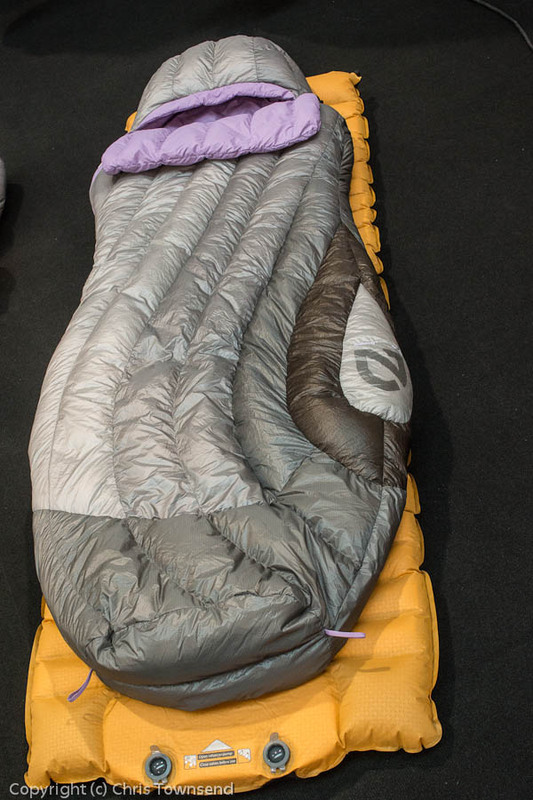 New ideas in sleeping bags would seem unlikely but two companies had come up with them. Nemo showed the unusual-looking Wave bag that is very curvy and designed to allow comfortable sleeping on your side or any other position. Cascade Designs had sleeping bags with straps underneath to secure them to sleeping pads as with quilts. These are full bags though. Other bags looked more conventional. Of these I particularly liked Lightwave’s first down bags as they are ultralight and the quality looks superb. 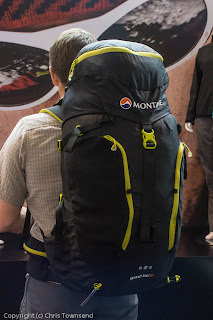 Montane launched their first packs at the show last year. For 2012 they have expanded the range with a bigger pack, the lightweight Grand Tour 55, that has some interesting features. 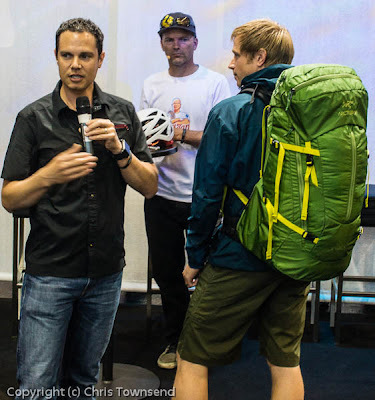 Other good looking lightweight backpacking packs came from Arc’teryx. In stoves there were two that I’m looking forward to trying. 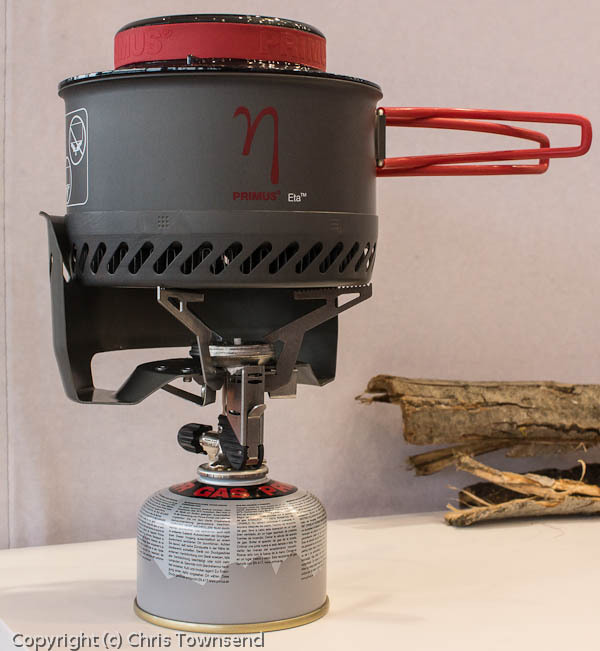 Primus has completely redesigned the EtaExpress with a windscreen that fits properly and a wider, lower profile pot while MSR has finally made a smaller version of the powerful Reactor. Whilst there are plenty of new colourful base and midlayers in clothing it was two shell jackets that really caught my eye. 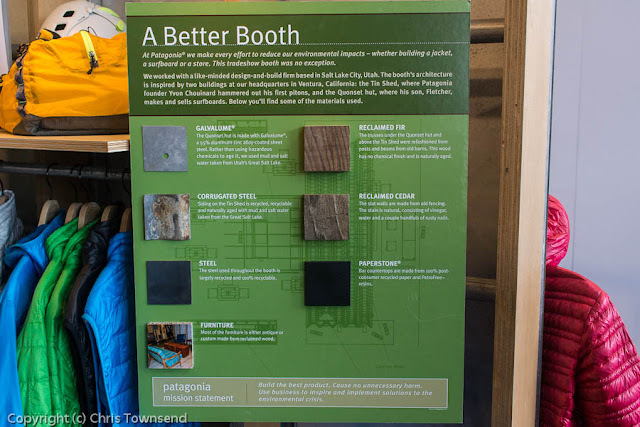 In Gore-Tex Active Shell Berghaus has designed a jacket, the Vapour Storm, with the most thorough venting system I’ve ever seen. In Neoshell, my current favourite waterproof fabric, Rab has a new lightweight jacket, the Myriad. 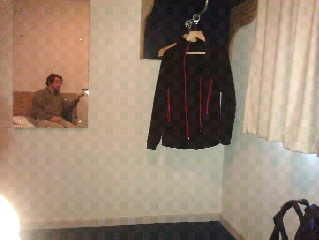 An amazingly bland hotel room, somewhere near Edinburgh Airport. Tomorrow flight to Zurich then two trains to Friedrichshafen and my first appointment at 5.30. 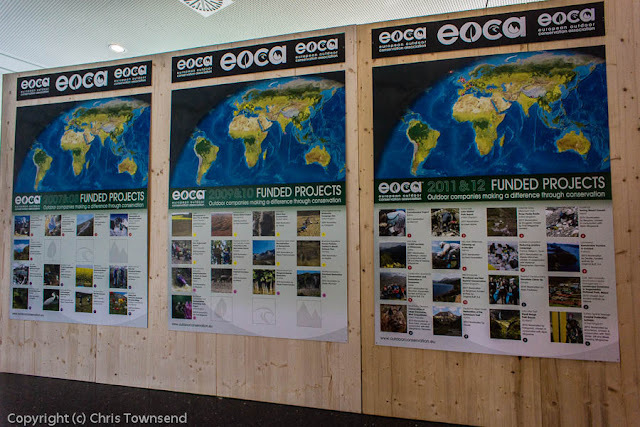 Then two days of looking at gear, walking the cavernous halls and talking, talking, talking. No more hotels though as I'm camping outside the show, which at least means no commuting. Time, wi-fi and charging points allowing there should be reports of interesting new gear appearing on the TGO website and maybe a mention here. 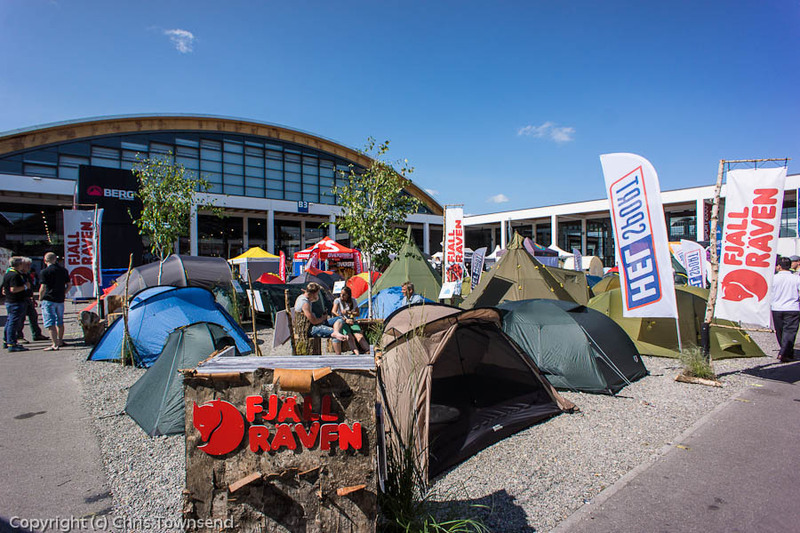 The Winners of the Scandinavian Outdoor Gear Award have now been officially announced so I can tell you what we decided at our meeting in Are in Sweden (see my post here) earlier this month. 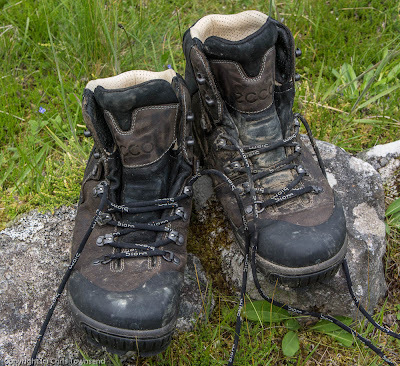 These boots won because of their combination of instant comfort, quality materials, solid construction and performance on rugged terrain. 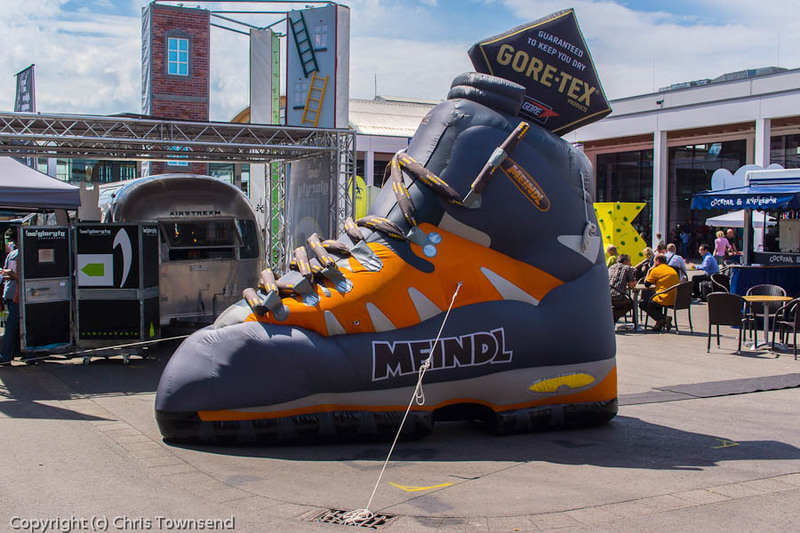 I wore them for the two days of the judging and was impressed by the comfort, not something I expect straight away from chunky boots like these. Indeed, at the campsite and during the walk the next day I quickly forgot I was wearing them, which is exactly how walking footwear should be. The other judges who tried them said the same. I also wore them on the walk over Areskutan the day after the judging (see this post), which further confirmed my view that these are excellent boots. 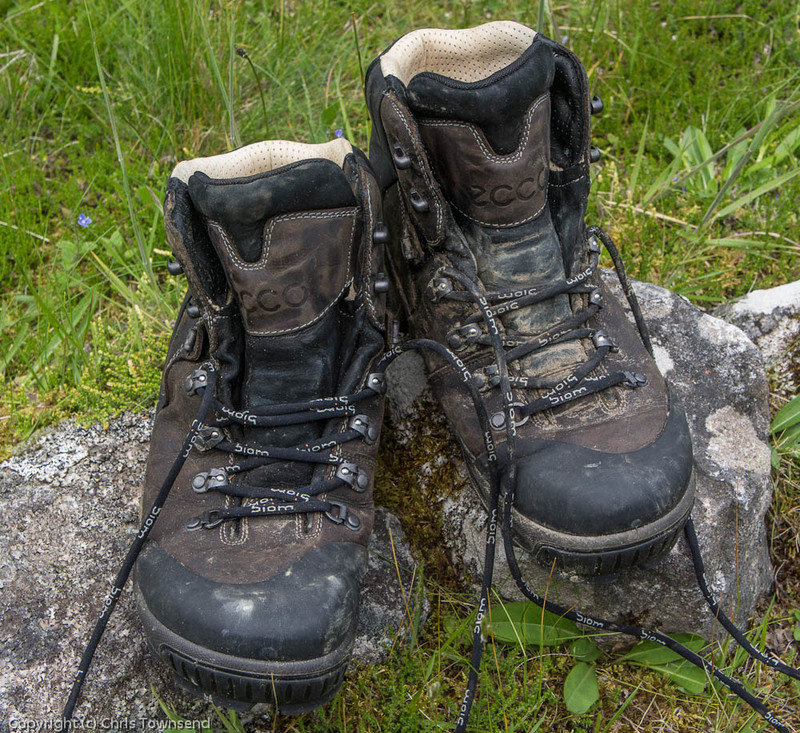 The boots were worn on snow, mud, wet grass, wet rock and loose soil and stones and were secure with a good grip on all of them. They have a low profile sole that gives more of the feel of a trail shoe than a big boot. They’re made from yak leather, said to be three times tougher than cow hide, treated to be water-repellent and have a Gore-Tex lining. Certainly on initial use they are completely waterproof. Ecco say they will keep your feet warm down to -24ºC whilst walking. We weren’t able to test this (thankfully as it was June!) 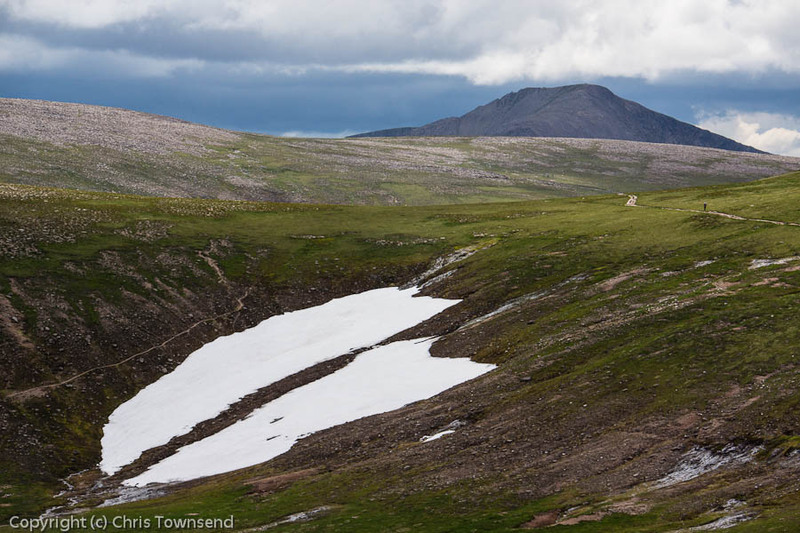 but the weather was fairly chilly with a cold wind and the terrain was wet with many snow patches to cross. My feet felt pretty warm, though not overheated. I reckon these boots will be fine for October to May use in Britain but too warm for summer (though maybe not in summers like this one so far). 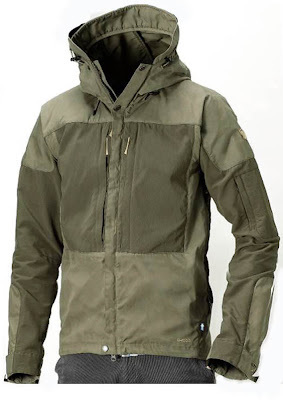 This is a substantial jacket made from recycled polyester and organic cotton. It’s windproof and very water-resistant and can be reproofed with Fjallraven’s Gwax and so should prove very durable. The design is good with a big hood with stiffened peak, big chest pockets and no shoulder seams. There are stretch panels so the jacket can be close-fitting without restriction of movement. I tried the jacket on but didn’t wear it during the field test. The judge who did found it comfortable and waterproof in the showers and drizzle we experienced. As it’s quite a heavy and bulky jacket that gives a great deal of protection I think in the UK it would be a cold weather garment; one to be worn all day rather than carried. I could see it being excellent in Scottish blizzards. There were three products that we felt were worthy of honourable mentions. This ultralight daypack is made from Blue Sign approved materials and all the components, including buckles and webbing, are colour-matched. As the colour of the test model was bright pink this made it easy to spot at a distance! (You can see it in some of my pictures of the judging day). The design is very stable and the pack and pockets can be opened with one hand. By marrying ultralight fabrics with traditional designs Helsport has produced the lightest fully specified tunnel tents yet made. There are 2, 3 and 4 person models. As the light fabric does move more in the wind than heavier ones we felt that the two person Camp 2 was the best model. This only weighs 1.65kg. I tried the much bigger 4 person model and found it easy to pitch by myself. This car roof kayak rack was the one item I couldn’t judge, never had a roof rack or a kayak, but those familiar with such things reckoned it made loading kayaks far easier and gave much better protection against theft. 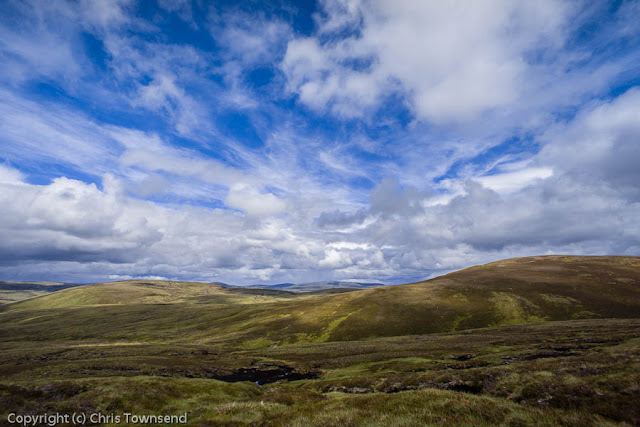 Three weeks ago I went up to the site of the proposed Allt Duine wind farm with Roger Cox of The Scotsman newspaper on behalf of the Save the Monadhliath Campaign. The day was overcast and windy with very low cloud and bits of rain - the picture above was taken during one of the clearer periods. 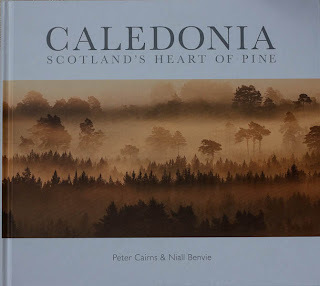 Despite this I hope that Roger appreciated the wildness, subtle beauty and solitude of the area and realises the utter destruction of this that would be caused by the wind farm. His feature on our trip and the wind farm will appear in tomorrow's edition of the paper. I'm looking forward to seeing what he has to say. 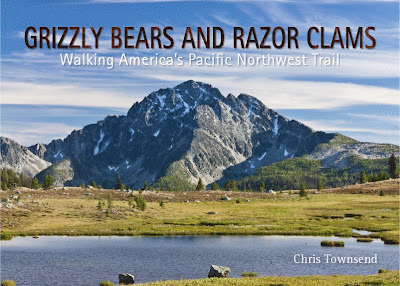 One of the first backpacking books I ever read advised wearing a string vest under a thin lambswool sweater for comfort in cold weather. I duly bought both items and found that the system worked quite well. The string vest was made by Norwegian company Brynje. Whilst remaining popular in Norway Brynje string vests and other clothing disappeared from British outdoor stores many years ago. Now Brynje is back in the UK, courtesy of new company Nordic Life. Last winter and spring I had the opportunity of trying some Brynje clothing - 2 hats, fleece and, of course, string vest. 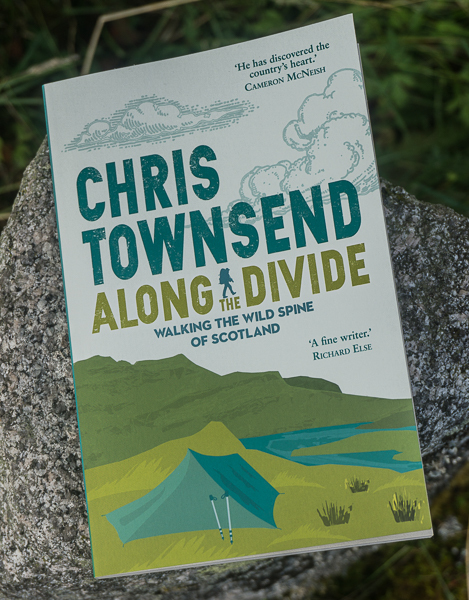 My review is now on the TGO website here.